The lifespan of interior trends often varies, some stick around for an indefinite amount of time, while others quickly feel passé months after the hype. So as we gradually welcome the new year, let's delve into five current interior trends we Singaporeans love to adopt, a few we've seen slowly getting more attention while the rest have solidly stayed at the top. Wood is an essential part of almost every home we've seen, and almost always a huge bout of home owners' furniture is made in the material. That's also no surprise though, since wood is absolutely easy to match, and adds a cheery atmosphere to any home. Especially with our obsession of minimalistic and Scandinavian themes, wood is even higher in demand these days, so it's definitely a trend that's still going strong. In our opinion, wood will probably never fall out of trend. 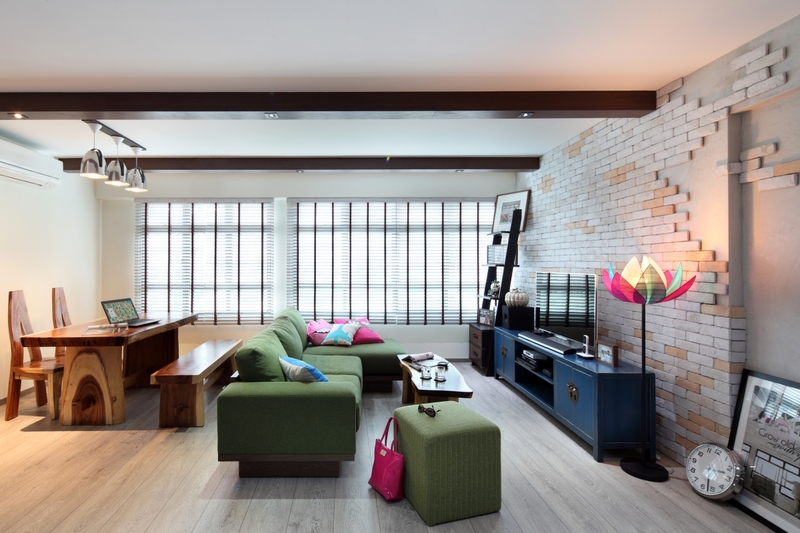 If you've realized, the number of home owners opting for an industrial themed interior are increasing. That's not quite a surprise though, since the trend is absolutely modern and chic. And with the theme comes an excessive use of grey, particularly in the form of cement. What was once thought of as too gaudy and dreary, has now been one of the most commonly used colours for walls and furniture. Accent walls seem to fall in and out of trend over the years in an endless cycles, but recently we've seen them start to pop up in Singaporean homes all over again. Honestly we get excited seeing an accent wall, because it allows us to have a glimpse at home owners' personalities and likes. Some prefer textured walls for a pop, while others prefer to indulge in a glorious wallpaper spread. Either way, accent walls definitely do the trick in bringing out a room, and we'd highly recommend it. Pendant lights are definitely here to stay, and we've seen Singaporeans' obsession with them only grow. Many seemed to prefer subtler and simpler designs at first, but now home owners are hunting for louder and more unique designs. We're not complaining though, because we secretly have an undying love for them too. Especially when they become the focal point of a room, which is seemingly what's happening here in the picture above; we're hopelessly drawn to those lights! As Singaporeans we're pretty practical, preferring hassle free standardized closets with doors that keep dust out. But perhaps times have changed and so have people's mindsets, and now they're exploring all types of closets and having fun with it. We're seeing more open closets without doors, which is a lovely touch, as well as more home owners willing to give up part of their bedroom space for a walk-in closet. Some still rather their clothes be kept enclosed, but they've added a more contemporary touch with transparent glass doors.